This is the blanket you want to sit and read under on a cold night. It’s called the Wombat Banket because it’s marsupial; there’s a pocket for your feet so they don’t get uncovered. The pocket is only a foot or so deep, though, so if the phone rings or you get hungry you can get up without getting tangled up in your blanket. It’s written with plenty of options: choose among a garter version, a stockinette version with a cable (as shown), a ‘recipe’ version that lets you choose whatever stitch pattern or center cable you want, and an optional knitted-on cable border (shown below). 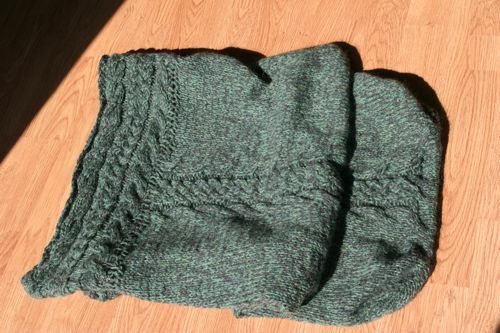 Make it just the right length for yourself or whoever you want to give it to (one test knitter pointed out that it would be a great stroller blanket for a toddler). 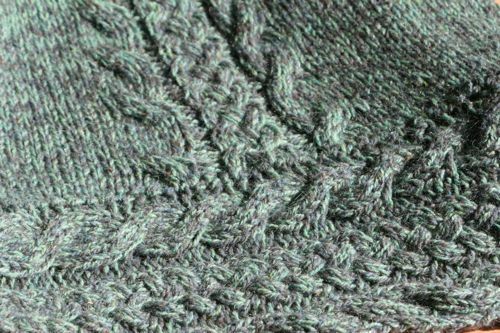 The one in this picture is knitted with two kinds of Peace Fleece, a strand of sea-green DK held together with a strand of gray worsted, but it can be knitted with any bulky or super-bulky yarn, or any combination of yarns that add up to bulky / superbulky.